White Gold Oval Color Photo Jewelry Pendant, one of Apples of Gold's most popular jewelry accessory pieces, makes a fine addition to anyone's collection. Available in either 14k or 18k fine white gold, this color photo pendant is perfect for any style and any look you may be looking to achieve. Elegance meets simplicity with the white gold and intricate cut design edge. 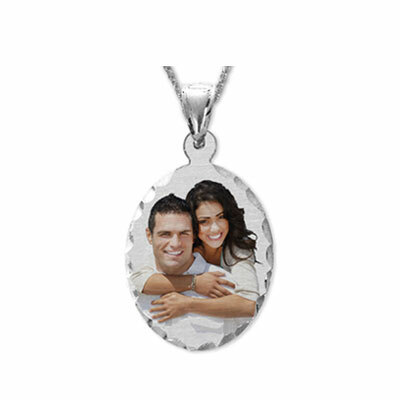 Select a color photo and have it imposed on the pendant to display the person or thing that is near and dear to your heart so everyone can see. The pendant measures in at 1.15" x 0.77" and is the perfect size to catch people's eyes without being too overpowering. Find the best in luxury jewelry right here! We guarantee our White Gold Oval Color Photo Jewelry Pendant with Diamond Cut Edges to be high quality, authentic jewelry, as described above.